A quick-to-make pudding with layers of flavour, this uses the best of fine British ingredients. 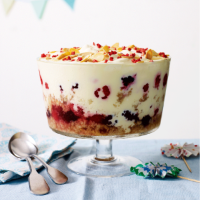 It makes the perfect dessert to serve at a traditional British celebration. 1. Place the berries in a bowl and gently stir in the icing sugar and berry smoothie. Set aside for 5-10 minutes. 5 minutes, then spoon over half the berries and some of the liquid from the bowl. Crumble the remaining cake on top, sprinkle with the rest of the sherry, then spoon over the last of the berries and any juices. 3. In a separate bowl, whisk the soft cheese until smooth then add the custard, whisking until well blended. Pour over the fruit. Cover with clingfilm and chill. 4. When ready to serve, spoon the extra thick double cream over the top of the custard layer. Scatter over the almonds and freeze dried strawberries, and serve. To make individual servings, prepare the trifle mixture in 8 wine glasses, layering up the ingredients to get the same effect. For even more flavour, use fresh berries in summer when available. This recipe was first published in Fri Mar 18 09:51:27 GMT 2016.